Close to 90,000 parents, or sixty-five per cent, of elementary school parents answered the Toronto District School Board’s census sent home last fall. The results are coming out now and reveal the unequal opportunities which children of different family backgrounds enjoy. A recent TDSB research report presents a startling picture of class and racial inequality among our youngest city residents. 28% families reported a family income of less than $30,000/year. 21% reported $30,000 – $49,999/year. 15% reported $50,000 – $74,999/year. 10% reported $75,000 – $99,999/year. TDSB research report on 2011 census of parents with children in Kindergarten through Grade Six. The impact of these different family income levels was also reflected, as would be expected, in the out-of-school experience of children. Parents in each income group were asked about their children’s extra-curricular and pre-school activities. 25% children in lowest income families enrolled their child in a child care centre. 29% children in the middle-income families enrolled their child in a child care centre. 45% children in highest income families enrolled their child in a child care centre. 25% children in lowest income families attended a pre-school program. 34% children in the middle-income families attended a pre-school program. 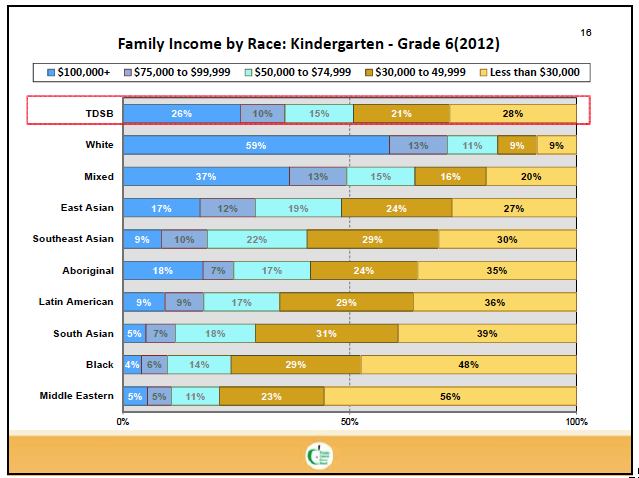 56% children in highest income families attended a pre-school program. 80% parents in lowest income group said their child is safe on their street or in their neighbourhood. 90% parents in the middle-income group said their child is safe on their street or in their neighbourhood. 95% parents in highest income group said their child is safe on their street or in their neighbourhood. 64/% children in the highest income families are involved in sports or recreation activities outside of school. 54% children in the middle-income are involved in sports or recreation activities outside of school. 38% families in the lowest income bracket participate in sports or recreation activities outside of school. 59% children in the highest income in arts activities outside of school. 32% children in the lowest income families participate in arts activities outside of school. However, the second part of the survey was more heartening. When parents were asked about their child’s experiences in school, the differences, by income group, were much smaller, showing only a percentage point or two difference around such things as feeling safe or welcome in the school. This area is an improvement from the 2008 census, a period in which the school board has worked to make improvements. Opportunity. It’s a powerful idea, that everyone should have an equal chance, that every child should have an equal start. It underscores our sense of civic sense of fairness. Now, as ever, our school system must face this challenge outside its doors too.